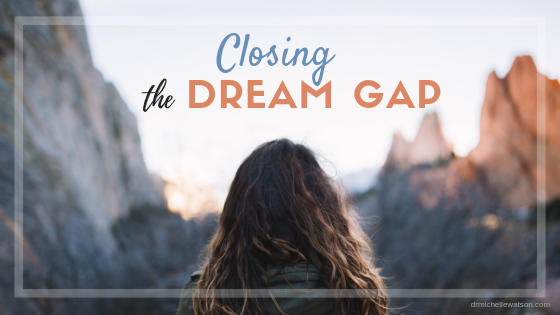 Over the past couple of years a new term has emerged called the ‘Dream Gap.’ You may have already heard of it, but for me this is something I just learned about recently. And because it’s rocking my world, I wanted to bring it to your attention, Dads. In 2017 researchers from NYU, Princeton, and the University of Illinois collaborated to present findings from their ground-breaking research, revealing that by the age of five, girls quit dreaming and stop believing they can be anything they want to be or do anything they set their minds to. By contrast, boys in this age range are not experiencing the same things. They also reported that by the age of six, girls stop associating brilliance with their gender and start avoiding activities that require what they perceive to be high levels of intelligence. Further, the more heart-breaking reality is that when these gender stereotypes regarding a lack of intellectual ability in females take root early, they are believed to have life-long negative impacts on their interests, choices, and career paths. In other words, when girls decline involvement in activities they believe are reserved only for those who are “really, really smart,” they tend to make choices not to engage in activities where they might have otherwise flourished had they tried. And these restrictive beliefs block young girls and women from pursuing their aspirations, which researchers believe correlates to women being underrepresented in fields that value genius, such as philosophy or physics. “I first heard about the Dream Gap back in May at Barbie headquarters, and it hit me hard. My daughter just turned four, and right now, she is such a bright, shining light in our family. She loves imagining who she can become and her dream is to become a worker (a construction worker) and a veterinarian (we’re lucky Barbie makes a vet doll and a builder doll!). One day she wants to build her own veterinary clinic. To her, anything is possible, and I want her to always believe that she can be or do anything she wants. Until reading this research, I hadn’t considered that I’m actually perfectly positioned inside this stereotypical norm group, mostly because of my own self-deprecating beliefs. Even more, I assumed that I would be convinced I was smart enough after graduating with my doctorate, which included doing my own research, then writing and defending my dissertation. ﻿But unfortunately, I wouldn’t say that there has been a positive shift in this area in the last decade. So here I am as an educated woman who still doesn’t fully believe that I have enough intellect to be considered truly intelligent. The crazy thing is that I don’t even know what enough would look like if I had it. I just know that I don’t believe I have as much as I possibly could have. Did you notice how many times I used the word enough? I assure you that I don’t believe I’m dumb. In fact, I know I have smarts. It’s more that I don’t think I’m smart enough. You’re probably a step ahead of me and can see that this statement elicits a follow-up question: Smart enough for what or smart enough in comparison to whom? Do you see how relative all of this is and how nebulous these concepts are? What does ‘enough’ even mean in practical terms? I was never as smart as Stephanie Weirson, a girl who was in my class from grade school through high school. And it seemed that every time we had a test, she finished long before I was even to the half way point. Solidifying her elevated position in my mind, she was always at the top of the leader board when our grades came out. So Ms. Weirson became my internalized standard against which I measured myself and she was always ahead of me because somehow I linked speed of responses to IQ. Yet now that I say it out loud, I realize how absurd that is! I have honestly never said any of this out loud quite like this…until now. So here I am admitting that somewhere along the way I adopted a skewed “grid for smartness” and it has gone unchallenged and uncontested…until now. I’m reluctant to admit this, but the reality is that I self-deprecate as much as the next woman even though, on the outside, no one would guess that I do. As a result, I’ve been believing a lie that hasn’t been broken because it’s never been spoken. In response to the study I mentioned at the start of this blog, Mattel launched a global campaign just three months ago called the ‘Dream Gap Project.’ Their goal is to close the gap that stands between girls and their full potential through raising awareness of gender biases and stereotypes that are placed on them at a young age, reinforced primarily by the media and from subtle messages by adults. Thus, they are encouraging girls to counter their self-limiting beliefs by dreaming for more while reaching for the stars. You may feel like there’s very little you can do to override the powerful undertow of our cultural tide that comes against your daughter with negative messages that attack the very qualities that you seek to see displayed in her. You may believe your efforts are futile to successfully celebrate your daughter’s creativity, brilliance, optimism, vision, and passion when she isn’t always met with the same enthusiasm and support outside of your home. And, Dad, if you want one more idea to help your daughter close the dream gap, I encourage you to invite her to write a list of TEN OUTRAGEOUS THINGS SHE WISHES SHE HAD THE NERVE TO DO. Then have her date and sign it. A decade ago I wrote out my list of ten outrageous things and one of them was “to write a book.” It seemed like a crazy impossibility at the time, but then in 2014 my first book was released. So I speak from personal experience when I say: Dream it and do it! For extra dad points, you can create your own list, modeling to your daughter that you’re never too old to set new goals and think forward in expanding normal limits. This list can also serve as a prayer guide as you agree with God to support your daughter to live beyond her natural limits as she is released into his supernatural calling on her life! Dad, you can help to close the dream gap today by standing in the gap with your daughter. Start the Year With Your Own "Vehicle Inspection"